We are happy to provide you with a variety of services and surgeries to meet your varying optical needs, from examinations to in-depth procedures. Seeing clearly can not only allow you to work more efficiently, but it can also enhance your quality of life by making the activities you love easier. When it comes to visual clarity, you may have changes in your eyesight that occur slowly through time, so it is important to schedule regular eye exams to test your vision and explore the right solutions for your needs. 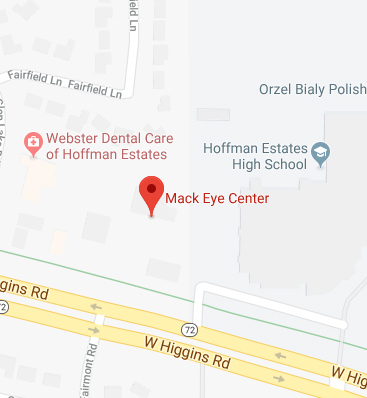 At Mack Eye Center, you can find complete optical care in Hoffman Estates with an experienced team dedicated to an individualized approach for every patient. There are a few telltale signs that it is time to schedule an optical appointment and update your eyeglass or contact prescription. If you have noticed extra difficulty seeing during daily tasks due to blurry vision, glare, or light halos, you should visit the optometrist. You might also schedule a visit if you have symptoms such as eye pain, dryness, or frequent headaches, which can all indicate common eye problems that you won’t want to ignore. Generally, it is recommended that you see the eye doctor annually for preventive checkups, including a comprehensive eye exam. Optical care is the focus of measuring and improving vision, and this begins with general eye exams to diagnose problems such as nearsightedness, farsightedness, or astigmatism. Below, you can get a closer look at our optical services to sharpen your vision and improve your quality of life. Eye exams – General eye exams will measure your visual acuity and allow the doctor to get a look at the structure of your eye to diagnose any developing problems early on. If you have specific symptoms, you should inform our team when you make your appointment so that any special diagnostic procedures will be included in the exam if needed. Glasses and frames – If your vision is less than 20/20 and you need corrective lenses, you might choose from a wide range of designer frames with the help of our expert team. We can help you select the best pair of frames for your style and features and provide you with lenses that fit your lifestyle. Whether you need UV protection, anti-glare, or progressive lenses, we can help you design the perfect pair for everyday wear. Contact lenses – Whether you have worn contacts for years or you are looking to wear them for the first time, we make it easy to order the lenses you need. We will also give you a tutorial for proper contact lens care to ensure the health of your eyes. To schedule an appointment at Mack Eye Center, call us at (847) 755-9393 230-4214. From optical care to bladeless cataract surgery, we will provide comprehensive care to keep your eyes healthy.